The long chain of omega 3 fatty acids is called EPA (eicosapentaenoic acid) and DHA (docosahexaenoic acid). These are found in high amount of fish and shellfish. The short chain omega 3 fatty acids are called ALA, (alpha linolenic acid). These omega 3 fatty acids are found mainly in plant like flaxseeds and sunflower seeds. ALA is also beneficial for the system, but are less potent than the health benefits provided by the EPA and DHA. The other useful fatty acid in the fish oil is gamma-linolenic acid or GLA. The best sources of fish oil are mackerel, trout, lake trout, halibuts, sardine, oyster, salmon, tuna, sea bass, pilchards and anchovies. Fishes commonly used for obtaining oil are herring, salmon, mackerel, sardines and trout. The quality of fish oil depends entirely on the fish used for obtaining the oil. Fish oil has been hailed for a variety of health giving properties. The health benefits of fish oil can be attributed to the presence of omega 3 fatty acids DHA and EPA in it. As most of you know, fish oil prevents the inflammation and improves the digestion. However, the benefits of the fish oil are way beyond that. It improves the bone density and helps to burn excess fat in the body. It also prevents diseases like cancer, depression, asthma, autoimmune disease and cardiovascular diseases. 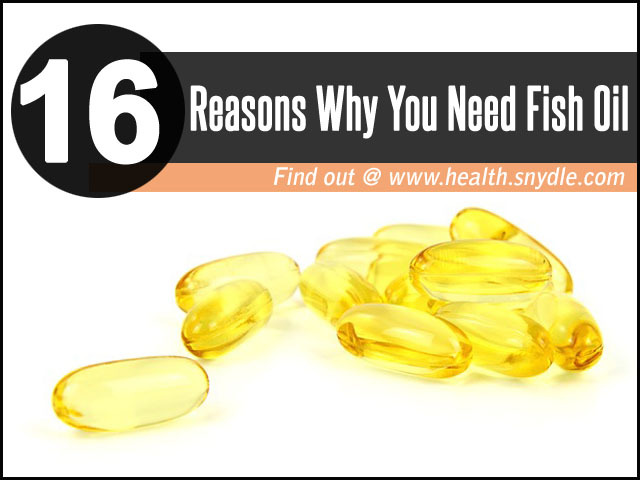 Here are some amazing benefits of fish oil that you were not aware of. Fish oil can help enhance the cognitive functioning of the brain. A diet deficient in omega 3 fatty acids can cause the brain to age faster and lose its memory thinking abilities. It reduces the risk of Alzheimer’s diseases or dementia. DHA is also passed from mother to the unborn baby for developing the brain. It soothes and prevents neuropathic pain caused due to injuries in the sensory system. Supplementing the diet with fish oil can prevent muscle loss in cancer patients. According to a trial, the volunteers who did not take fish oil lost an average of 2.3 kg weight, while patients receiving fish oil had a steady weight. They also gained muscle mass. The omega 3 fatty acid DHA is very essential for optimal bone health. It is very useful in the treatment of arthritis, rheumatism, osteoporosis and other similar conditions. It is a vital constituent in maintaining bone mineral density. According to a study held in the University of Bristol, omega 3 fatty acids could significantly reduce the possibility of osteoporosis by 50%. It reduces the impact of enzymes that destroy the cartilage, one of the main reasons of osteoporosis. Take three capsules of fish oil daily with a meal twice a day for reducing inflammation. Regular consumption can also reduce the need of large doses of NSAINs (non-steroidal anti-inflammatory drugs). Did you know that fish oil could protect you from air pollution? Yes, that is right. According to a study, omega 3 fatty acids in fish oil can provide protection from the adverse cardiac and lipid effects associated with the pollution exposure. Several evidences have suggested that fish oil could inhibit the cell function and cellular regeneration that cause premature ageing. A study has uncovered a link between blood levels of fish oil and the rate of telomere shortening over five years. Eating fish oil twice a week is a great way to keep ageing at bay. The insulin sensitizing properties of DHA and the anti-inflammatory benefits of fish oil make it an efficient fat burning food. According to a study, overweight and obese adults who took omega 3 fish oil supplements in combination with moderate exercise lost an average of 7 pounds a week. Fish oil improves the efficacy of exercise in people who want to reduce weight. It particularly reduced the abdominal fat. People who eat fish oil on a regular basis are at a much lower risk of developing prostate cancer than those who do not. Eating 1 tablespoon of fish oil daily can lower the risk of cancer by 64%. It helps in weight management of patients suffering from pancreatic cancer. The supplements can also help patients suffering from cancer-related hyperlipidemia. Several clinical studies have shown that omega 3 fatty acids could be effective in reducing the risk of cardiovascular diseases like stroke, cardiac death and heart arrhythmias. According to a study conducted in the United States, people who ate fish oil daily had healthier arteries than those who ate little or no fish oil. The oil lowers the level of bad cholesterol and increases good cholesterol in the blood. It prevents the accumulation of triglyceride and reduces its level as well. A daily consumption of fish oil can also help to prevent atherosclerosis in coronary patients. Regular consumption of fish oil boosts the immune system, preventing the body from diseases like cough, cold and flu. The omega 3 fatty acids increase the effectiveness of cytokines and eicosanoids present in the body, thereby bolstering the immune system. It is very beneficial in patients suffering from lupus, autoimmune diseases, in which the body’s immune system attacks its own tissues or organs. It supports the functioning of white blood cells, the key cells to a healthy immune system. Fish oil can also reduce the risk of fever, fatigue and skin rashes. Fish oil is very effective in reducing inflammation of the blood and tissues. A diet rich in fish oil supplements is very beneficial to people suffering from chronic inflammatory diseases. It is also effective in treating the gastrointestinal disorders, irritable bowel syndrome, celiac diseases and ulcerative colitis. Fish oil prevents the accumulation of leukotriene on the colon in people suffering from ulcerative colitis. Fish oil is very useful in mood stabilization and treatment of bipolar disorder. It is ideal for relieving sadness, depression, anxiety, restlessness, mental fatigue, stress and suicidal tendencies. A study conducted on the prisoners has found that people who consumed fish oil on a regular basis noticed a significant drop in the homicide rate and frequency of violence. Fish oil can help improve the vision by preventing age related macular degeneration. The study conducted by the National Eye Institute provides strong scientific evidence regarding the benefits of fish oil for the eyes. As mentioned earlier, the omega 3 fatty acids in fish oil can improve the functions of the brain. Fish oil can help treat dyslexia, inability to complete tasks, dyspraxia, wavering attitude, low concentration, recklessness, hastiness, low IQ, and learning disorders. Give your child 2 fish oil capsule and evening primrose oil for about 15 weeks to notice a marked improvement in their intelligence. Infants of women who supplemented their diet with fish oil have better hand and eye co-ordination that those women who did not. Fish oil is excellent for improving the health of the skin. It is useful in treating the skin problems like psoriasis, itching, skin redness, lesions and rashes. The EPA present in the fish oil restricts the growth of pro-inflammatory agents by producing the arachidonic acid. Apply the fish oil topically to get relief from psoriasis and get a radiant and shiny skin. Eating fish oil supplements daily can also prevent moisture loss from the skin, keeping it supple. It is also believed to prevent sunburn caused by the harsh UV rays. Fish is an effective treatment for acne as well. It inhibits the formation of androgen, which affect the formation of sebum in the epidermis, leading to breakout. The DHA present in fish oil helps in the development of the eyes and brain of the fetus. It also helps to avoid premature birth, miscarriage and low birth rate. It is believed that insufficient levels of EPA and DHA can lead to post-delivery depression in women. Thus, it is very beneficial for the pregnant women to take fish oil supplements and capsules. Remember, cod liver oil should not be consumed during pregnancy, as it is rich in retinol and vitamin A. Fish oil can give you lustrous and shiny hair. Omega 3 fatty acids have hair growth stimulating properties as it provides nourishment to the follicles. It keeps the scalp conditioned, preventing dandruff and flakiness. Fish oil is also rich in protein, which helps to prevent hair loss and promote hair growth. Excessive consumption of fish oil can lower blood pressure in patients suffering from hypertension. It can also cause allergies on the body. Overdose of cod liver oil can lead to vitamin toxicity, which means the accumulation of excessive vitamins in the body. This can lead to serious side effects. Several companies sell ultra-refined fish oil or distilled dish oil. Make sure you check the standards and do a proper research on the company before adding the fish oil to your diet. So, make sure you consume dish oil supplements cautiously. It would be better if you could consult your physician for the exact dosage you should take. Fish oil can be consumed in various ways. You can eat the fish directly by baking, frying, grilling, roasting it. Alternatively, you can consume the oil in the form of dietary supplements like capsule, tablet, pills or soft gel. It is not necessary for the supplements to be of pharmaceutical grade.